There’s something causing quite a stir in the Canadian Rockies. No, it’s not a big horned sheep that’s learned how to yodel or a snowboarder who’s managed not to say ‘awesome’ for an entire day; it’s something far greater than both of these feats put together – they’ve only gone and built a skywalk! That’s right, a skywalk, where you can stroll, some 1,000 feet, above the majesty of the Icefields Parkway and not feel impaired by barriers or confined by seat belts. This is an amazing way to allow visitors to Alberta the chance to glimpse spectacular landscapes that have rarely been seen before all from a unique bird’s eye view. Imagine the photographs that you’ll be able to get that were once only the preserve of expensive helicopter rides and chartered scenic plane trips. Aside from the potential for pictures, the glacier skywalk has also been designed with education in mind and anyone undertaking the walk will be treated to an amazing learning experience where different info points will explain the environmental features of the surrounding Sunwapta Valley. Each of the six interpretive stations go some way to allowing you to understand the strength and importance of glaciers and by focusing on the local area this promises to be a fascinating first-hand experience that certainly beats sitting in a classroom. The further you stroll over the skywalk then the more you’ll discover and from geology and ecology to anthropology and hydrology, even the surliest of students will learn more about the Canadian Rockies and the importance of glaciers without even realising it. In fact, the environment is at the forefront of the skywalk’s designers’ main priorities and no glacial rock has been left unturned when it comes to minimising the impact to the natural landscape. Built from steel, glass and wood, the Glacier Skywalk is a remarkable example of eco-engineering done right and boasts an almost-zero carbon footprint record thanks to the collaboration of local construction firms and award-winning architectural designers. No matter where you turn, there’s never an instance where your viewing pleasure hasn’t been taken into consideration with cascading waterfalls, lush green meadows and shimmering glacial lakes all adding to the magical experience of walking high up above the ground below. Of course, sometimes the temptation to get even closer to the action can be too much to bear and luckily there are no end of ice bus tours, guided hikes and wildlife watching expeditions taking place at ground level so you can learn even more about the Canadian Rockies as you explore. 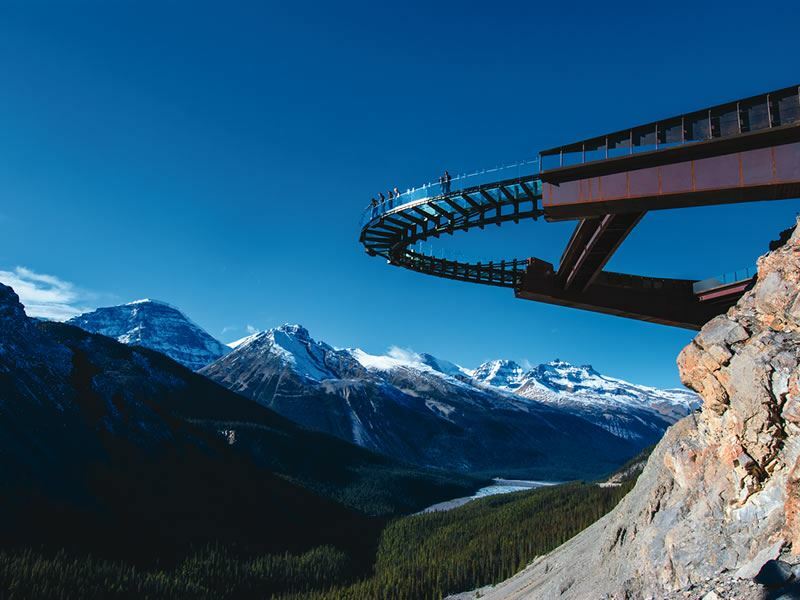 Also, as the Glacier Skywalk is located just one hour from Jasper and just over a couple of hours from Banff, it’s ideally placed so you can reach it on a day trip whilst being based in either of Alberta’s finest national parks. There’s just something about the Canadian Rockies that screams amazing adventures, with the new addition of the Glacier Skywalk adding to an already mesmerising mix of scenery, education and outdoor action that will leave you breathless and elated in equal measures. Further reading: Whether you're interested in skiing, snowshoeing or experiencing a dog sledding adventure, the beautiful outdoors destination of Jasper offers picturesque accommodation, brilliant activities and fantastic dining options.